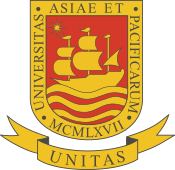 The University of Asia and the Pacific (UA&P) is a private university in the Philippines. It traces its beginnings to the Center for Research and Communication (CRC), which was established in August 15, 1967 as a private think-tank that conducted economic and social research and offered graduate courses in economics. Dr. Placido L. Mapa, Jr. The spiritual and doctrinal formation given in the University is entrusted to Opus Dei, a Personal prelature of the Catholic Church. The Center for Research and Communications (CRC) is a non-profit private research center established by former Finance Secretary Dr. Jesus P. Estanislao during the presidency of Corazon Aquino and Dr. Bernardo Villegas. It served as a "think tank" for private sector businesses and a provider of economics training programs. It was formally inaugurated in a rented facility along Jorge Bocobo Street in Malate, Manila on August 15, 1967. Prior to this, the CRC's first office was at offices of the United Coconut Authority of the Philippines, a private organization of coconut producers, then headed by Ambassador Jose V. Romero Jr. who served as its Executive Director. The transformation of CRC into a university was inspired by a private meeting in Mexico between the founder of Opus Dei, Msgr. Josemaría Escrivá, and the founders of CRC in 1970. The meeting encouraged Estanislao and Villegas to expand the institution's horizons internationally, which resulted to its first graduate program, the Masters in Industrial Economics. CRC then moved to its current campus in Ortigas Center, Pasig, with established formal and informal programs in 1982. A year later, the Center for Food and Agribusiness was established. Then in 1987, CRC was reminded by Bishop Álvaro del Portillo to establish a university. This resulted to the Institute of Development Education; the foundation for the School of Education. On March 19, 1989, the College of Arts and Sciences was established and admitted its first batch of 158 college students. The center finally gained its university status on June 26, 1995, with Dr. Estanislao as its first University President and Fr. Ramon Lopez, the regional Vicar of Opus Dei for Asia, as the its Vice Grand Chancellor. 1996 The School of Management was founded with Dr. Jose Rene C. Gayo as the Founding Dean. Mario D. Camacho installed as second University President. Visit by the University Grand Chancellor, Bishop Javier Echevarria, the Prelate of Opus Dei. Dean of the College of Arts and Sciences, Dr. Jose Maria Mariano installed as third University President. The Marketing Communication Effectiveness Awards (now the Tambuli Awards) launched. Visit by UA&P Grand Chancellor, Bishop Javier Echevarria. Tambuli Awards made an annual event, to further its advocacy of values in integrated marketing communications. School of Law and Governance established which replaced the Institute of Political Economy. UA&P, in pursuance to the K-12 program of DepEd, offers the 6-Year Integrated University Program, which consists of 2 years of General Education, 2.5 years of a Bachelor's degree program and 1.5 years of a Masters program. The University is made up of a college offering liberal arts courses as core curriculum and six schools of varied specializations. The Ortigas Campus has 5 buildings: Administration & Library Building (ALB), College of Arts and Sciences (CAS), Development Communications Building (DCB), APEC Communications Building (ACB), Parking and Sports Building (PSB) and 1 residential building. The university offers 15 undergraduate degrees and 11 graduate degrees. It also offers 2 fast-track Master's program: 5-Year Program (5YP), which is offered to incoming College (Freshman) students that allows them to earn a master's degree in just 5 years; and 6-Year Integrated Program (6YP), which is offered to incoming Junior College (Senior High School) students that allows them to earn a master's degree in just 6 years. UA&P's academic programs operate on a semester calendar beginning in early August and ending in mid-May. Since 1998, students are graded in increments of 0.25, from 3.00 (failing grade) to 1.00. Undergraduate students and students under the fast-track Master's program may graduate with latin honors depending on their graduating GWA. For students of stand alone graduate programs, they may graduate with High Distinction or with Distinction. The College of Arts and Sciences Student Executive Board is the executive office with the largest scope of functions and student body. The two other student government branches in UA&P are dedicated in serving students in the Entrepreneurial Management and Information Technology programs. As of 2012, the SEB has been called the USG (University Student Government). Kultura (Filipino term for "culture") is an arts center based in the University that organizes arts galleries and exhibitions, theater performances and concerts.It also moderates student-led arts organizations such as Dulaang ROC, Creative Writers' Guild, I-SA Dance Crew and the UA&P Chorale to name a few. The Office of Student Affairs' civics desk holds the annual youth conference Civitas Asia and the BIGGKAS project which extends tutorial sessions to local public schools. The desk also supports student organizations with socio-civic aims and activities. The University competes in the Men's National Collegiate Athletics Association (MNCAA) and the Women's National Collegiate Athletics Association (WNCAA). The University supports teams in basketball, futsal, volleyball, handball, tennis, badminton, swimming, arnis, taekwondo, aikido, karate, table tennis and athletics. In December 2008, the men's futsal team won the championship cup in the MNCAA. In October 2009, the women's basketball and volleyball teams won the championship titles in the WNCAA. In February 2012, the UA&P Firestarters, the university's all-female cheerdance varsity, grabbed the WNCAA cheerdance competition gold. Dr. Delfin Go - Lead Economist, World Bank, Washington, D.C. Ambassador Jose V. Romero Jr.
^ Chafuen, Alejandro (2013-05-22). "Will Think Tanks Become The Universities Of The 21st Century?". Forbes. ^ a b "University of Asia & the Pacific". opusdei.ph. ^ "The business editor par excellence". Manila Bulletin Business. Retrieved 2019-03-06. ^ "The Formative Years of CRC". UA&P Universitas. Retrieved 2019-03-06. ^ "Meet Google Drive – One place for all your files". drive.google.com. ^ Vitug, Marites Dañguilan; Bueza, Michael (2015-08-21). "EXCLUSIVE: No master's degrees for Ralph Recto". Rappler. Retrieved 2019-02-28.